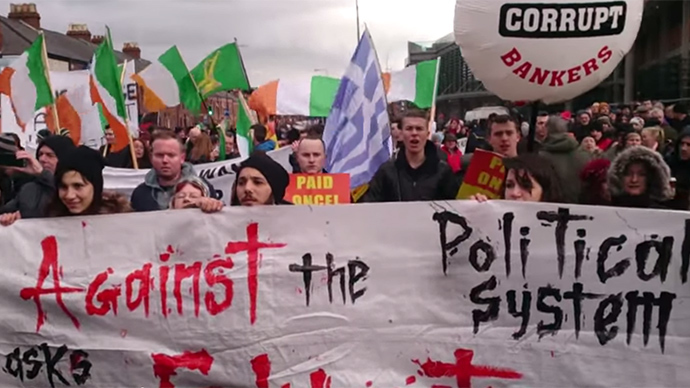 Thousands of people marched through Dublin to support two jailed anti-water charge protesters who have gone on hunger strike. Around 10,000 rallied in the Irish capital to back the duo, who started to refuse food on Friday. Five people are currently being held in prison after objecting to the Irish government’s decision to tax water. They had defied a court order to come within a 20-metre exclusion zone set up around a water installation. Tap water had been free in Ireland, though the government introduced measures to introduce water meters as an extra way to raise capital. Thousands of people, led by the families of the jailed protesters met outside Mountjoy prison in Dublin, where they are being held, after marching through the center of the city on Saturday. “Derek Byrne and Pauly Moore have stopped eating since yesterday,” said Audrey Clancy, who addressed up to 10,000 protesters. “And Derek Byrne has said if he’s not released by Monday he will stop drinking, he will take no fluid intake. These people are putting their lives on the line,” she added, as cited by the Irish Times. The Irish Prison Service didn’t confirm whether the inmates had gone on hunger strike. Byrne and two other protesters have been sent to jail for 28 days, while Paul Moore and the final demonstrator were given 56-day terms each. Post by Protest against water charges in the republic of Ireland. Earlier this week, the court had been shown footage recorded by security firms acting on behalf of water meter installers, GMC Sierra, which showed protesters in and around work stations. In a statement on February 19, Right2Water, which is leading the campaign against the water tax said it was shocked by the jailing of the protesters. “It is important to remember that these jailings are not as a result of any crime committed, but for a technical ‘contempt’ issue,” the campaign added, according to the Journal. Meanwhile Paul Murphy from the Socialist Party told demonstrators he was confident they would manage to overturn the government’s decision to introduce the tax. “The fact that so many people came out, maybe 10,000 people, at two days’ notice, that’s a sign that people are reacting, people are mobilizing. People know what’s happening is absolutely wrong,” as cited in the Irish Times. “We need to mobilize all of our selves to convince those in the middle not to pay. Mass non-payment will sink Irish water,” he added. Murphy added that he believes the government's water charges are a veiled austerity tax that many Irish citizens can't afford to pay. Speaking to RT on February 12, he said, “We have an establishment that is scared, scared that the lessons of Greece will be learnt, that there is an alternative to austerity and the establishment parties can be ousted,” he said. He was arrested two weeks ago following a police raid on his and other activists’ homes. This led to a ‘solidarity’ protest-taking place outside the Irish Embassy in London. In October, around 50,000 protesters took to the streets of Dublin to campaign against the new tax, one of the largest demonstrations in the country in years. They called for the government to re-think the tax and for people not to pay it if it was introduced. Ireland’s citizens had paid for their water services through general taxation. However, in 2014, the country’s center-right coalition decided to charge households several hundred euros a year for the service, which was introduced at the start of 2015.